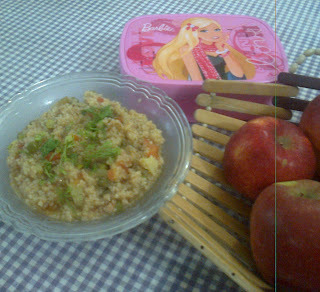 My Diary: What's in the tiffin mommy? What's in the tiffin mommy? Kids are pretty choosy about what they eat. With time I now know what my 3 year old likes to eat and how to disguise the veggies. From the very beginning I have been giving her fruits and veggies, it started with soups and stews, then purees, then bite size small pieces which can be eaten easily and don’t choke. If you have planned your menu in advance and do some weekend preparation as I mentioned here, these tiffin ideas barely take 5 mins to dole out. I grate thin carrots in poha and upma. I try to squeeze in cheese in most meals. I usually avoid refined flour (maida) or junk food and only use whole wheat bread. hi.. i am a new reader of your blog! and even though I don't have kids nor am I married, I really enjoy reading your blog! Hi Riya! As usual a very nice writeup :) Although I would like to include a few more things from a Dietician's point of view and really hope it could help you. 1) Try including different cereals like Jowar, Bajra, Jow, Ragi in your princesses' food too! As such if I want to add it'll be huge list..but till then I hope this would be helpful to you! Good Luck Babes..You for sure are a rocking Mum! Thanx nidhi! Although we use multigrain ata to make rotis and parathas so we are already using all u mentioned alongwith corn. Aashirwad Multigrains ata is really good. Hi Nidhi, that does'nt happen in ready to eat packed versions available in market from leading brands, coz i know about the deterioation in taste thing that usually happens if you use different attas available and then add it urself! try pre packed versions-m using AASHIRWAAD, it tastes yum and rotis come out damn soft.